Nokia results are just out, and they’re terrible. 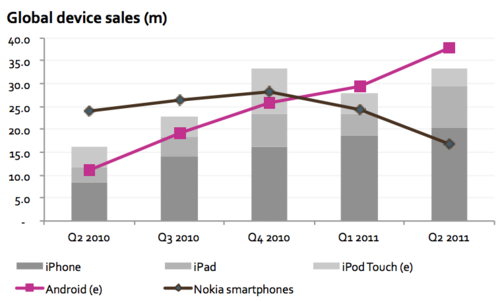 Apart from everything else, it sold just 16.7m smartphones in the quarter. This means it sold less than Apple and less than half Android. Of course, the picture would be equally bad if Nokia had chosen Android or stuck with Symbian/Meego instead of choosing Windows Phone - Nokia simply has no competitive devices in the mid range and high end of the market this year.